Yesware has had an incredible year in 2012. We’ve added 8 new team members, passed over 100,000 users, added well-received features and introduced new Team, Enterprise and Custom service levels for 2013. To show our appreciation and thank users who subscribe to a premium service level we’re glad to announce our ‘Coffee is for Closers’ promotion. Our customers are some of the best salespeople in the world. We know you’re all closers! So for the month of January, we want to celebrate the power of your deal-making with a cup of coffee, or several pots. From January 1 through January 31, we’ll send a complimentary Starbucks eGift Card to any users signing up for premium Yesware tiers. 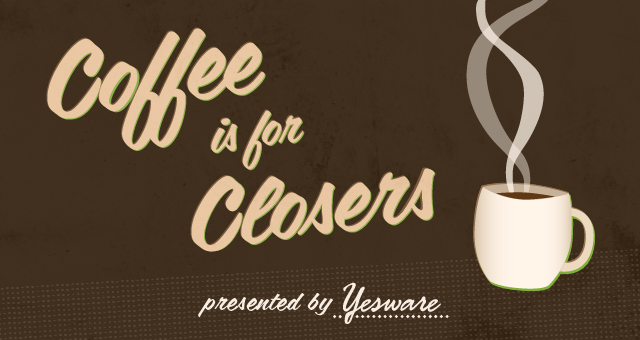 Now, when you close more deals faster using Yesware, you’ll be able to reward your team with coffee on us! So go ahead and purchase Plus, Team or Enterprise for yourself and your team and we’ll send you the first monthly cost of that purchase as a complimentary gift. We encourage you to tweet about your order using #coffeeisforclosers and keep us updated on the deals you close in the new year. Thanks for using Yesware, Email (and coffee) for Salespeople. The promotion will run from January 1- 31 2013 or until the total cost has exceeded $5,000. Each payment account will be eligible for a maximum gift of $500 in Starbucks ecard credit. New paid customers will be awarded Starbucks Gift Cards the following week of their initial purchase via email. This promotion is redeemable once per payment account. Current paid users or discounted new paid users are not eligible.